Lizzie Quinn thinks she's tough. But when Lizzie is attacked in her local park, she realises just how vulnerable she is. She knows she has to get her confidence back. The thing is, she's scared of her own shadow these days. Lizzie Q, why so blue? Then she receives a letter in the mail, unsigned. Her stupid friends...or maybe her short-lived boyfriend? But they all deny it. More letters arrive and Lizzie begins to think someone is watching her. She has a stalker. 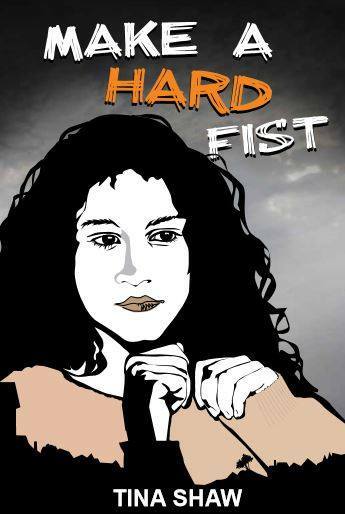 MAKE A HARD FIST is an extremely powerful YA novel about the physical abuse of young women. It is edgy, scary and yet empowering. Lizzie Quinn is doing well, well apart from a hiccough in her relationship with a boy she just wanted to be friends with, and he wanted more. She is doing well at running, loves pizza, has some great mates, and is saving to buy a Volkswagen Beetle off her uncle. But then she starts to receive weird one-line messages in the mail. She thinks it might be one of the spurned boy’s silly mates – but she isn’t sure. Lizzie is confident, funny and feisty, but one day she is attacked while taking a short-cut home through a reserve. The Police are supportive; Detective Sergeant Rose Wallis is patient trying to get a description of the man, but Lizzie struggles to remember. Then she finds out there has been another attack, and the other girl hasn’t been as ‘lucky’ as Lizzie. After the attack Lizzie is a changed person, she is not so quick to joke, her life is monochrome. She talks to a counsellor, but she still feels under threat – and the notes keep arriving. MAKE A HARD FIST is powerfully written; the attacks described will be hard reading for anyone who has been in that situation – as so many of us have. At least the Police are trying to find her attacker; when it happened to me in the 1970s the first question the Police asked my parents was ‘what was she wearing?’ There are also funny moments in the book, lovely family and friend relationships, and one unexpected show of support for Lizzie that had me in tears. MAKE A HARD FIST is a psychological thriller, even when Lizzie is feeling a bit more normal the reader gets a sense that worse is to come and danger is lurking everywhere. As Lizzie confesses to Rose Wallace: “It just feels like it’s never going to end.” The change in Lizzie after the attack is well portrayed, as is the effect it has on her family and friends. She finds strength and vulnerability in unlikely people. The novel is also a YA love story, sort of. Lizzie is trying to sort out her feelings and her priorities, both enormous tasks for a teenage girl without the threat of violence or unwanted attention. Another good aspect of the novel is its recognition of the unfortunate normalisation of violence in our society; Lizzie’s father just wants to ‘beat the living daylights out of’ her attacker, she sees an uncontrollable violent streak in Junior, Junior got his fighting skills out of necessity with the violence in his family, Lizzie realises one of her school mates is interested in the self-defence session because of ongoing abuse at home, you get the feeling Rose Wallace has been attacked at some time in her past, etc. etc. MAKE A HARD FIST is a challenging but important novel.